If you’re one of the many who suffer from seasonal allergies, you might feel forced to choose between a really miserable couple of seasons of sniffling, scratchy throat, coughing, itchy eyes – or the alternative – taking medications that you’d prefer not to take, or that make you sleepy and zap your energy or make you feel dried out. But I have some great news: natural remedies can really help. Here, I’m sharing my top go-to supplements and strategies to relieve seasonal allergy symptoms. I’m going to explain what they are and how they work, plus how you can get started on your natural and non-drowsy seasonal allergy plan. If you’re looking for quick relief from your seasonal allergies, you’re in the right place. If you want to dive deeper into the root cause behind seasonal allergies, and how you can heal them for good, head over here for my post on the subject. Have you tried these natural remedies and supplements to relieve your seasonal allergy symptoms? I have some great news: Natural remedies can really help. To relieve seasonal allergies, pick from one or a combination of several of the following herbs and supplements to be taken daily. Whenever possible, it’s fantastic if you can get onto this plan even before allergy season hits, but you can start anytime and still get great relief! You can also take them on an as-needed basis, but my experience is that taking them daily through the allergy season(s) that hit you is the most effective strategy for maximum relief. Can I Take These During Pregnancy or While Breastfeeding? The probiotics, NAC, and freeze-dried stinging nettles can be safely taken in pregnancy, though I don’t recommend any supplements other than you prenatal vitamins and possibly a probiotic in the first trimester, and always check with your doctor or midwife before taking supplements in pregnancy. The other supplements and herbs should not be taken in pregnancy. These are generally considered safe for seasonal use while breastfeeding. Can My Child Use These Remedies? 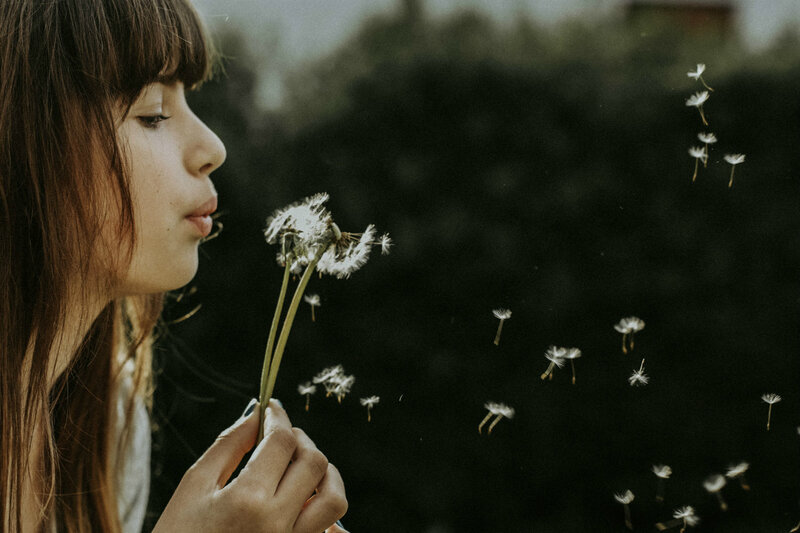 Probiotics, NAC, and nasal saline rinses have all been studied in children for allergies or cold symptoms, and have been found to be safe and effective. The remedies below may also be used for children. The dose for children 5-12 years old would be about ¼- ⅓ of the adult dose, and for kids 12 and over, ½ to the full adult dose depending on their size. But make sure to check with your child’s doctor before starting any new supplements. If you want to learn a whole lot more about kids and allergies, check out my course The Allergy Epidemic, right here. If you’ve ever gardened near a patch of stinging nettles you know that this herb can pack a little wallop of burning fire if you brush up the wrong way. But when it comes to allergy relief, this humble herb can really do the trick and has been a go-to in my herbal and medical practice for 35 years, often in combination with quericitin (see below). Nettles also some nice science to back up its use: One study found that 600mg of the freeze-dried form in capsules daily was able to reduce symptoms compared to placebo and 48% of people in the study found it better than other over-the- counter medications. It works by inhibiting the breakdown of something called ‘mast cells’ in your body. Mast cells are where histamine is formed, stored, and released. So by preventing their breakdown, they act as a natural antihistamine. But the cool thing is that this natural version doesn’t make you sleepy or dry you out. Dose: 300 mg 2-3 times daily. Tea can be taken for very mild allergy symptoms, but overall I find the freeze-dried form most effective. Findings from a 2007 systematic review of six randomized controlled trials suggest that butterbur is superior to placebo or similarly effective compared with nonsedative antihistamines for intermittent allergic rhinitis. In one study of 125 individuals with allergies, it was been found to be as effective in relieving allergic rhinitis as Zyrtec to relieve symptoms of tearing, itchy, and red eyes associated with seasonal allergies. The usual dose is 75 mg twice a day. IT’s important that any product you purchase be labeled “PA Free” for safety (PA’s are a chemical that can cause liver damage, but when removed from the herb, the product is considered safe) . Probiotics are certainly the rage. And rightly so. Probiotics containing Lactobacillus and Bifidobacterium species have been shown to support healthy immunity. They are also effective in helping to heal the gut, which we now recognize, when imbalanced, can be a source of many inflammatory conditions – including seasonal allergies! Large systematic reviews of the medical literature have shown that probiotics, taken for seasonal allergies, may improve the overall quality of life and reduce nasal allergy symptoms. You can take a probiotic supplement seasonally for extra support, and also include yummy live fermented foods like sauerkraut and fermented vegetables in your diet, or if you eat dairy, live whole milk yogurt. Quercetin is a yellowish plant pigment found in many common herbs and foods, such as onions, apples, and other fruits and vegetables. In supplement form, it is used as an anti-inflammatory and boosts the immunity in your mucus membranes (your nasal and breathing passages) while reducing reactivity to seasonal allergens like pollen. Recent research shows that quercetin it is effective for allergies, because it inhibits histamine release – in other words, it’s a natural antihistamine. But it’s one that doesn’t dry you out or make you sleepy. The usual dose is 500 mg daily. It should not be taken during pregnancy because of potentially harmful effects on fetal development. NAC has beneficial anti-inflammatory and mucolytic capabilities that can help to relieve common seasonal allergy symptoms like nasal congestion. The typical dose is 300 to 900 milligrams, three times a day. Beyond using natural supplements, other lifestyle habits can help lower the severity of seasonal allergy symptoms so you can experience quick relief. One of them is using a neti pot. A 2012 systematic review and meta-analysis of 10 studies found that saline nasal irrigation from using a neti pot resulted in less irritation and mucus. It also improved quality of life in adults and children with allergic rhinitis, or seasonal allergies. One of the ways it works is by cleaning out the pollen from the nasal passages. Use distilled or boiled water in your neti pot when making your saline solution to avoid contamination, and do it one to three times a week for up to seven weeks. Another way to address seasonal allergy symptoms through your lifestyle habits is to lower stress- which can affect your immune response and is associated with increased allergic reactivity. Read more about my tips on how to beat stress naturally here. Finally, if you want to dive deeper into the root cause of seasonal allergies and how to heal them for good by healing your gut, you can find that in my post here. Have you tried these natural remedies and supplements to relieve your seasonal allergy symptoms? Let me know in the comments! Greaves, MW. Chronic idiopathic urticaria. Curr Opin Allergy Clin Immunol. 2003 Oct;3(5):395-9. Ivory, K. et al. Oral Delivery of a Probiotic Induced Changes at the Nasal Mucosa of Seasonal Allergic Rhinitis Subjects after Local Allergen Challenge: A Randomised Clinical Trial PLoS One. 2013; 8(11): e78650. Liezmann CB, Klapp BF, Peters EM. Stress, atopy and allergy: a re-evaluation from a psychoneuroimmunologic perspective. Dermatoendocrinol 2011;3: 37–40. 12. Mittman, P. Randomized, double-blind study of freeze-dried Urtica dioica in the treatment of allergic rhinitis. Planta Med. 1990 Feb;56(1):44-7. Stoner, G, Wang, LS. (2013). Natural Products as Anti-inflammatory Agents. In Obesity, Inflammation and Cancer (pp. 341-361). Springer New York. West, CE. Probiotics for allergy prevention. – NCBI Benef Microbes. 2016;7(2):171-9. Zajac AE, Adams AS, , Turner JH. A systematic review and meta-analysis of probiotics for the treatment of allergic rhinitis. Int Forum Allergy Rhinol. 2015 Jun;5(6):524-32. doi: 10.1002/alr.21492.